Andrea Lubin, Stephanie DiPetrillo and Steven R. Fittante. 121 pages. (Client: NJ Department of Human Services) December 2012. New Jersey’s 21 county community transportation providers – like many of their peers nationwide – are facing economic difficulties in maintaining and enhancing the vital services they provide to transportation disadvantaged persons, including people with disabilities seeking to access employment. 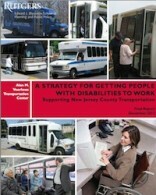 This two-year study documents these difficulties and investigates best practices that could assist county community transportation providers in New Jersey and beyond cope, allowing them to better serve those most in need of transportation support.